The phone rings and it’s Louis Milone, the old crew chief from my days driving Audi sedans for Champion Racing. 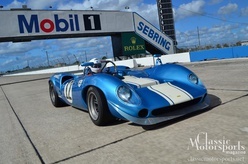 He has a can’t-refuse offer: Would I like to drive with them at HSR’s Classic 12 Hours of Sebring? A bit of a classic myself, but with a competitive fire still burning in the hearth, I answer with a resounding yes. After a lifelong career as a pro road racer, I have driven many high-level modern race machines. I drove under factory contracts with Porsche, Audi, Mazda and Volvo. We scored championships in turbocharged, all-wheel-drive racers from Audi and Volvo. We won twice at the Rolex 24 At Daytona in Porsche 911 race cars, and we finished top five in both a tube-frame Camaro and a tube-frame Mazda RX-8. I’ve sampled a current BMW DTM car, a Lamborghini Huracán GT3, and even the very same Audi R18 e-tron quattro prototype that won at the 24 Hours of Le Mans just three months later. These modern marvels use 21st-century technology like advanced tires, anti-lock brakes, electronic engine management and traction control, sequential and now paddle-shifting transmissions, carbon-fiber chassis and suspension, and even a hybrid diesel-electric drivetrain with a 40,000 rpm energy-storing flywheel. As I roll up to the Team Mean paddock on the Sebring concrete–poured in late 1941–I behold a minimalist, wedge-shaped machine that is much more closely related to the B-17 bombers that flew there than to the pro-level marvels I’ve had the good fortune to wring out. Owner John Harrold smiles proudly next to the knee-high sports racer he’s been driving for a good 10 years: a 1979 Chevron B36. It wears chassis No. 001, a factory car. Chevrons were the very successful brainchild of brilliant self-taught designer Derek Bennett, and it is said that every one was a great car. 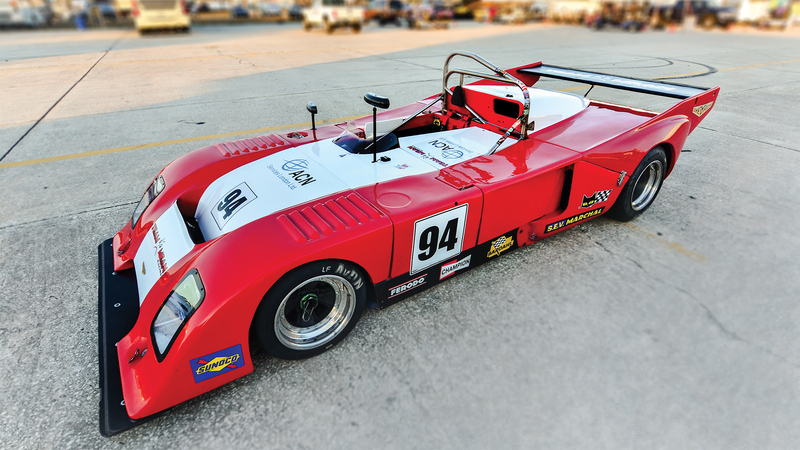 The B36 was designed for the FIA European 2-liter sports racing formula that was quite popular in the mid-’70s, and it’s a beautifully balanced mix of light weight, early aero downforce and high-rpm power. I’ve seen these make mincemeat of some very famous golden-era V8 and V12 icons from the ’60s at vintage events, yet the Chevrons only run four highly efficient, normally aspirated cylinders. Just like those WWII warbirds, the B36 is constructed as a monocoque, with sheet aluminum riveted and boxed over buttresses and spars of the same material. Meanwhile, the DTM, GT3 and prototype, like modern aircraft, have lighter and stronger carbon-fiber tubs baked in an autoclave. 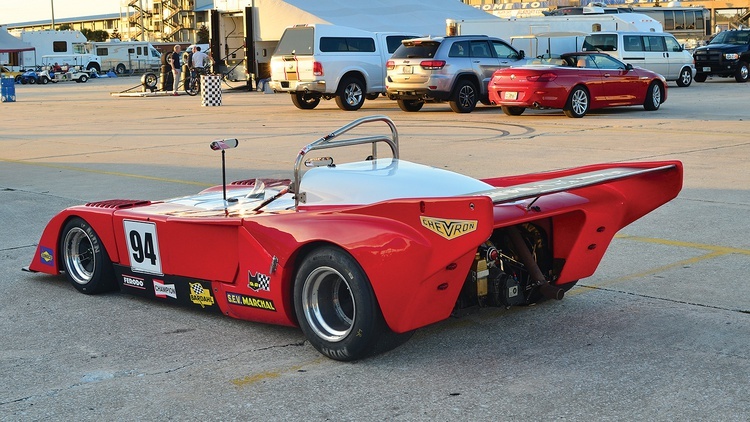 The Chevron’s body is of a different kind of fiber–fiberglass–and the car is quite small by today’s standards, enabling it to cling to Earth with only 1200 pounds of pressure. 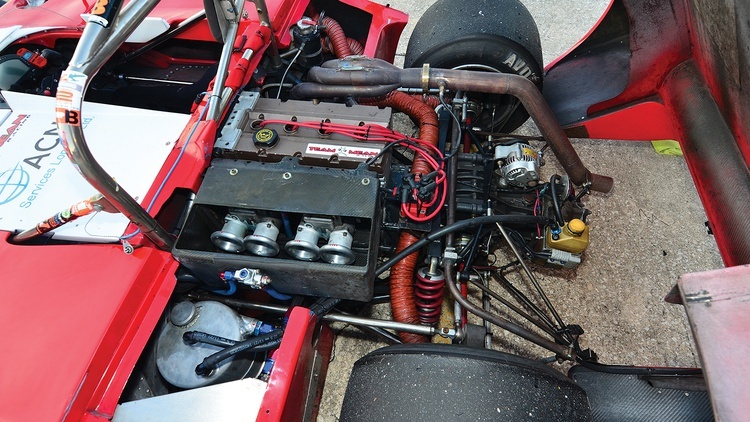 Harrold’s car sports a rare aluminum-block version of the Cosworth YB and is fed fuel through the same wonderful Giovanni Venturi carburetors as that B-17. Two iconic giant, 50mm sidedraft Weber DCOEs allow 8000 rpm and even 9000 rpm if necessary, similar to today’s GT engines though much smaller. “Sliding into the cockpit” is appropriate verbiage, as the B36 looks and feels like a vintage aircraft on the inside, too. It fits like a slipper, and my body is nearly prone. There is a striking paucity of knobs, switches and gauges compared to the complexity of today’s cockpits, although Milone has added a modern gauge display to improve engine survivability. The skinny roll bar overhead and the side-mounted fuel tanks next to me remind me not to crash this thing for the sake of driver survivability. Safety is far advanced in current cars, to the point where foolish drivers can sail through with ignorant, aggressive, destructive driving. That’s the downside of safety. Back in the mid-’70s, safety was improving, but there was still a long way to go. With a couple pumps of the gas (carbs, y’know) and a push of the quaint rubber-covered starter button, I’m introduced to the strong inherent second-order vibrations of an inline-four directly bolted in as a structural member. Modern cars don’t shake like this. I gently rev the engine to warm it and keep it from loading up. I don’t trust it to idle cold like one of my pro cars with perfectly injected management. At Sebring this December, it’s 52 degrees at 8 a.m. and 82 degrees at 3 p.m., but we aren’t changing jets. Today’s cars adjust themselves, obsoleting what once was the great art of carb tuning. As we roll off the grid, the clutch is stiff to push but has a nice, wide engagement. The gas pedal works a real, live throttle cable that yanks open those big Webers with a rush of air through the scoop just behind and beside my head. I swear I can feel the pressure change in my helmet. I know I feel the resonance tap dancing on my eardrums, even with good earplugs. Despite the car’s minimal weight, it demands real steering effort–boy, is it real–unlike modern cars with their electro-hydraulic assists. Fifth gear is an effort, too, demanding a firm shove against a strong spring detent, bruising my bony ring finger in just three laps and bringing to mind the 2 to 3 hours I will be driving this formidable sprinter. Even so, I find that shifting the Hewland FG400 straight-cut five-speed is a real pleasure. H-patterns were gone from pro cars by the mid-2000s as sequentials took over, followed by those paddle shifters that feel all video gamer to an old-school heel-and-toe’r like me. Whadda ya know, ya gotta actually shift this thing! Blipping is tough. The foot is accustomed to jamming the stiff brake pedal, but the no-flywheel-mass Cosworth revs so dang instantly that the touch on the gas requires a light finesse. The art of shifting is alive here, and the life of your engine and gearbox depend on it. I love it. At 8500 intense rpm, the howling four is making about 300 horses, each thrusting forward just 4 pounds. Do the math: That’s like your 3600-pound BMW street car having 900 tire-twisting horsepower. The straights are a mad, howling pleasure. In the lower gears, I strain to hold my head up against the accel g’s, snapping gears, reveling in the joys of high power paired with low weight. This thing will kill a big GT car off a tight turn, but their big engines pull harder over 130 mph. Furthermore, the gaping Webers bog for a moment every time I roll into the gas, reminding us that it’s carbs. Milone says he’ll crank up the accelerator pumps. Sure, modern engine management is always perfect, until some electrical gremlin appears and drives you nuts. Carbs weren’t all that bad. The springs feel relatively soft, and the vintage-style Avon tires are bias-ply. That means the Chevron rolls a bit and runs some slip angle in the corners. You younger drivers should try bias-ply tires sometime. They love to slide–require it, even. Even though I’m inches from the concrete, the car soaks up the famous Sebring moguls nicely while the wind whistles ’round my helmet. The factory Porsches were leaping all over the same bumps in my day, and while their radial slicks have great grip, when they let go, they really let go. It was often fast hands and chase the oversteer. The B36 is planted–totally stuck. The Chevron, for all its exotic looks, builds driver confidence–no doubt a secret of its success. A proper-handling car doesn’t even need electronic controls. This chassis puts power to the ground. I find myself rolling into the throttle sooner and sooner. By 1979, aero was in full swing and the rules nannies hadn’t yet clamped down. This B36 is a good example of that era, with its huge wing and pioneering splitter. And they work. Another reason to gas it early: That wing is twice the width of modern racing versions, and so effective that it cries for more splitter to balance the front. But lordy, it is stable–the Hand of God out back at high speeds (I like that), but pushy because it was more front air dam and spoiler than superior ground-effect advancements back then. Most of the current cars I’ve driven tend toward growing oversteer over 120, but not this one. Braking is more of an enigma. Brave as I could get, I was only about even with the best Porsches in my group. With so much less avoirdupois, we shoulda been better. Early in my first practice, I felt the car wandering and twitching when hard on the binders, so I moved the bias forward. (The driver is the ABS here, kids.) But during the race I started cranking it back, and stopping g-force was improving by my feel-meter. A lot of front brake can feel like rear bias, and I now believe we need to work the other way next time. A modern Porsche is so “tight.” Responses are instant. Roll is heavily damped. 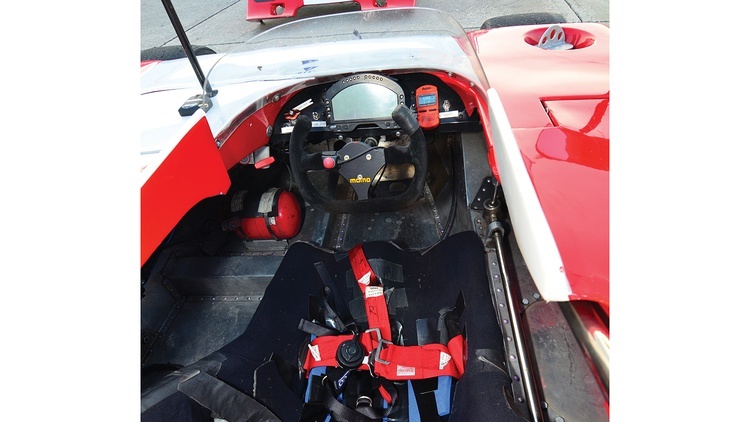 Tire grip is higher than ever, with brake pedals firm and immediate. Steering is assisted, with zero free play. Shifting is done by levers on the wheel. The Chevron, on the other hand, has a vintage feel–yes, by which I mean more roll, slower responses and more effort. A little wiggle and sway by contrast. More organic and way less brutal. The actual shifting is a delight: so involving, so traditional. Can’t believe I’m saying this, but I miss it. It’s a new world. As with cubic inches, there is no substitute for light weight. The B36 feels so much like a part of the body. Like I’m wearing it, not riding in it. Nor is it driving me. It is not a threatening car. There is no fear. This is the plus of the slower responses and the happy slide at the tire contact patch. A well-set-up Chevron encourages the driver to explore the limits. I found them higher than expected–except, as noted, in braking, where some finer tuning is in order for the team. The Chevrons marked the end of the era when a talented grassroots enthusiast could build a winning race car in the garage–without computers or degrees. It was a truly beautiful thing. Sound like a fantastic ride. Thank you for taking us along. Great article. I'll take the analog driving experience any day over today's electronic nannies.